Welded structures | HANAKOV, spol. s r.o. Welded structures – HANAKOV, spol. s r.o. We weld steel and stainless steel of various types, with particular focus on custom manufacture of welded structures and special welded parts according to the customers’ individual requests. We employ highly qualified welders certified in conformity with European standards, who utilize different welding methods, such as MIG/MAG a TIG/WIG. We can weld both small parts in fixtures which we make as well as large and heavy welded structures. For our regular customers, we execute piece as well as series production, for which we can achieve interesting prices. We manufacture and supply a lot of special, technologically and materially highly sophisticated products for various industries. In particular, we focus on foundry equipment and special welded parts of electric motor frames. In our production, therefore, you can see products in progress, such as heat exchangers for cooling of foundry sand, stainless tubing for exchangers, steel as well as stainless frames of electric motors and many other products from various materials. All of our welders have passed welding tests according to the standard; there is also a certified welding engineer at our disposal. In the long term, we strive to employ persons of the highest quality from our region and provide them with professional education. Thanks to this philosophy, as we are convinced, we are able to compete even with bigger companies in the Czech Republic. To weld these products, we naturally possess valid certificates and attestations as well. 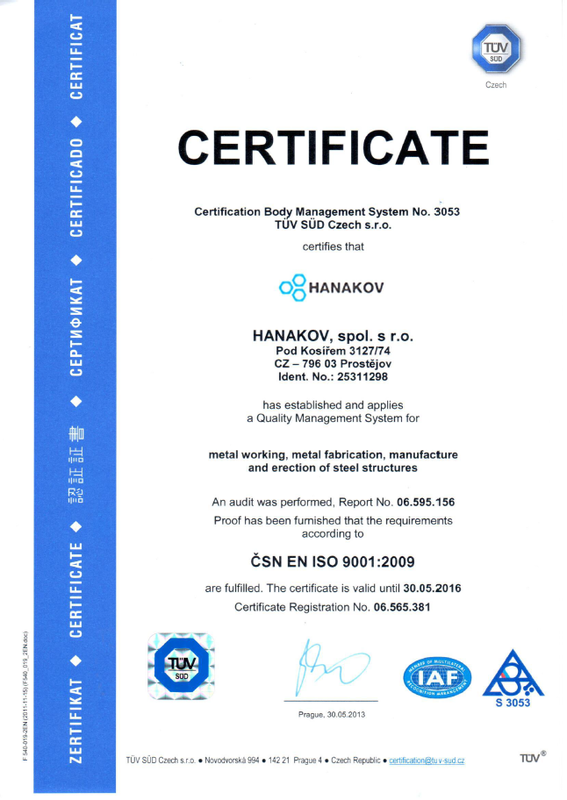 Why welded structures from the HANAKOV company? We weld steel of all grades, including stainless steel. We weld small as well as big structures. Professional team of welders including a welding engineer. We manufacture pieces as well as series.